Review by AllTheBestFights.com: 2017-04-08, fight not particularly good between Will Brooks and Charles Oliveira: it gets two stars (UFC Performance of the Night). The former Bellator Lw champion Will Brooks entered this fight with a professional record of 18-2-0 (50% finishing rate) and he is ranked as the No.13 lightweight in the world. He fought twice last year beating Ross Pearson (=Brooks vs Pearson) and losing to Alex Oliveira (=Brooks vs Oliveira). His opponent, the black belt in Brazilian jiu-jitsu Charles Oliveira, has a mma record of 21-7-0 (90% finishing rate) and he entered as the No.24 in the same weight class but he lost three out of his last four bouts, the last one with Ricardo Lamas (=Lamas vs Oliveira). 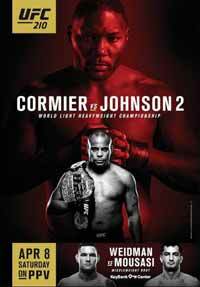 Charles Oliveira vs Will Brooks is on the undercard of Daniel Cormier vs Anthony Johnson 2 – UFC 210. Watch the video and rate this fight!